I love commercials with babies. Maybe it’s because my first brand assignment was on Johnson’s Baby Products or maybe it’s because I like the potty humor, not sure. It’s certainly not because I love hanging out with babies, though, I found that part of life as a Dad way too stressful! 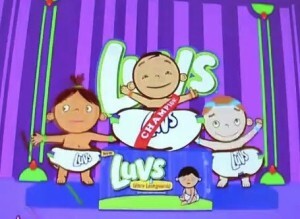 I love the marketing of Luvs diapers. You would think that it would take second fiddle to Pampers in the P&G portfolio, but it certainly doesn’t look that way. It is the lower cost brand, but that doesn’t mean as a consumer you give up any performance or engagement with the brand. The brand just appears to be a lot more straight forward. Luvs cuts it straight—shows the real part of being a parent. This is all about making sure everything stays in one place before you have a chance to change it, right? Nothing more, nothing less. So the brand uses language like “Double Dooty Protection” and “Blowouts”… stuff we can relate to and smile with as parents. “What happens in Luvs, stays in Luvs”—gotta love that! And the brand is keeping up. New advertising (featuring a blowout competition), new diaper designs that improve performance and style, new packaging with added information … and a community manager on Facebook that speaks directly with parents and lives their lives with them. I particularly like that she thanks Moms and Dads! Not rocket science for sure, just good diaper marketing. I don’t know the sales figures, but Luvs is certainly no second fiddle.